Arsenal host Atletico Madrid this Thursday in the huge Europa League semi-final first-leg clash. Arsene Wenger dropped a bombshell last Friday when he announced he would be leaving the Gunners after 22 seasons at the helm. Tributes have been pouring in from all quarters this past weekend – and he will be hoping his side can give him the perfect send off by winning the Europa League. 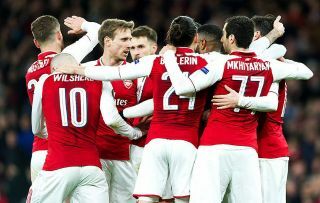 Arguably, the Gunners need to win the Europa League more than Atleti – given that they are 6th in the Premier League and are set to miss out on a top four place again this season. Diego Simeone’s side lost 3-0 to Real Sociedad last week and drew 0-0 to Real Betis on Sunday but a top four place in La Liga is guaranteed as they are 2nd with 72 points with only four games left. Arsenal and Atletico have never played a competitive match in Europe together. When is Arsenal v Atletico Madrid and what time is kick-off? Arsenal host Atletico Madrid at the Emirates Stadium, London, with kick-off scheduled for 8:05pm on Thursday, April 26. The match will be televised on BT Sport 2 and BT Sport 4K UHD from 7:30pm. BT Sport subscribers can stream the match online via the video player and BT Sport app. Mohamed Elneny is out after suffering a worrying ankle injury against West Ham and is expected to be out for three weeks. Henrikh Mkhitaryan has been great in Europe but is also unavailable with a knee injury. Danny Welbeck could continue in the starting XI and displaying good form recently. Mesut Ozil should come in for Alex Iwobi after suffering from illness and Jack Wilshere could return after an ankle knock. Former Chelsea striker Diego Costa (hamstring) is a major injury doubt for Atleti. Right-back Juanfran is also a doubt for both legs after suffering a thigh injury. Meanwhile, Felipe Luis continues his recovery from a broken ankle.